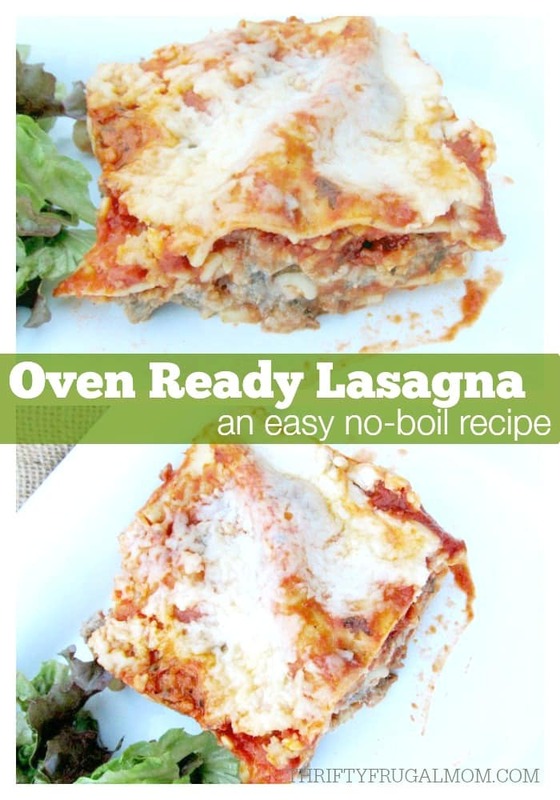 This oven ready lasagna recipe uses regular lasagna noodles and saves you prep time! Plus it makes a great freezer meal too! I’m all about saving time and being efficient in the kitchen. I mean really, who’s not? So when I discovered this no boil lasagna recipe soon after we were married, I was pretty delighted. I love that I can make a delicious lasagna and not have to bother with boiling the noodles. Plus it freezes well, so I can make it ahead of time and pull it out to use as a meal for guests or for “one of those days”. I also wanted to point out that you don’t even have to use no-boil lasagna noodles for this recipe- that is unless you super funny about noodle texture. I almost always use the regular noodles and honestly can’t tell a bit of difference. But then while I’m funny about many things related to food, noodle texture is not one of them. So do whatever you think best! Update: Reader Alex left this comment on my Facebook page. “Ok, i made this tonight for dinner! I didn’t notice, nor did my family, that the noodles weren’t boiled. Thanks, Lydia, i sure will be making it like this from now on!! !” So if you are on the fence as to which kind of noodles to use maybe that will help you. Brown beef and onion, drain fat. Stir garlic salt and oregano into spaghetti sauce. Spread one cup of sauce on the bottom of baking dish. Add ½ the noodles then top with 1 cup sauce. Add all of the meat and cottage cheese and ½ of the cheese. Add Parmesan cheese if using. Top with ¾ cup sauce then add remaining noodles. Top with the rest of the sauce and then the remaining cheese. Cover with foil. Bake at 350 degrees for 1 hour. Let stand 15 to 20 minutes before serving. Recipe works best if made at least several hours ahead of baking.